Shocked and stunned, I was determined to prove him wrong! After many years of self-observation and experimentation on myself I have personally found this statement to be one of the most powerful truths anyone has ever shared with me. I believe that integrity is one of the most important aspects of any whole-functioning human being. So Why Is Integrity So Important? Profound integrity is much more than just doing what you say you are going to do. It is through true integrity that you transform a promise into reality. Integrity is an exact manifestation of a prearranged agreement no matter how important or trivial. 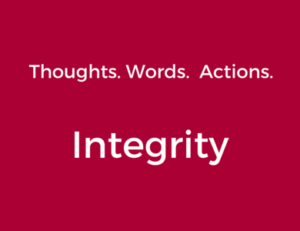 Therefore, integrity is a unity of thoughts, words and actions. For example, when I make a commitment with myself to run one mile three times a week, I talk about running on those days, and I honestly follow through exactly as thought out – I am displaying integrity. Integrity is the virtue that enables a person to come through time after time, year after year, no matter what the sacrifice. However, integrity is more than keeping your word; it is being true to your self. Webster described integrity as “a steadfast adherence to what one knows is right.” It is not talking about being constrained by limited moralities. It is talking about making decisions based on what a person knows in their heart to be true. When you follow your heart, you become more effective in your ability to manage the pressures of society. It is through integrity that one is able to be sincere, honest and truthful with every individual, especially yourself. Profound Integrity will require unreasonableness with yourself which is why it is such a rare characteristic. It requires rigor to bring it forth. What Is The Price We Pay For Being Out Of Integrity? When someone lacks personal integrity it affects their self esteem, self worth, and self value. It erodes their confidence and takes away their authentic power. Eventually they will lose their life’s skills and start to live by force, control, manipulation and intimidation. When someone violates their own integrity it causes guilt, shame and often embarrassment. If their Integrity is continually “out” their word will not count for anything – it will have no value or no meaning as it lacks trust. Integrity requires us to honor our commitments and keep our promises (our word) – no matter how small or large – both to ourselves and others. The lowest form of Integrity is keeping your word, while the highest form of Integrity is being your word. As a result of keeping your promises and honoring your conscience, the quality of integrity results in being a whole and complete person. Living in integrity is truly a profound way to live. Integrity is the means by which you becomes one with your life’s purpose. Living an integral life is about being whole and complete in your world – living truthfully, being open and honest in honoring your values and principles with respect, compassion and dignity. Integrity provides for an extraordinary life. Most people have a completely different relationship to their personal commitments with themselves and they believe it does not have any correlation to the commitments they make with others. I have found that if I am out of integrity with myself, I will be out of integrity with others and/or they will be out of integrity with me to the same extent. For example, if I make commitments to myself and 50% of the time I do not keep those commitments, I have found that others will be out of integrity with me 50% of the time. When someone lacks personal integrity, it affects their self esteem, self worth, and self value. It erodes their confidence and takes away their authentic power. Eventually they will lose their life’s skills and start to live by force, control, manipulation and intimidation. When someone violates their own integrity it causes guilt, shame and often embarrassment. If their Integrity is continually “out” their word will not count for anything – it will have no value or no meaning as it lacks trust. So How Can You Restore Integrity? Communication is the key. If you are out of integrity with someone, that is you have broken an agreement, it is imperative to immediately communicate with the other person, acknowledge the wrongdoing and restore the relationship by being open, honest and authentic. This work will require character and substance in being responsible for sharing the truth with compassion and humility. You restore your Integrity by recommitting to honor your agreements and promises (your word) – do what you say you are going to do, when you say you are going to do it.